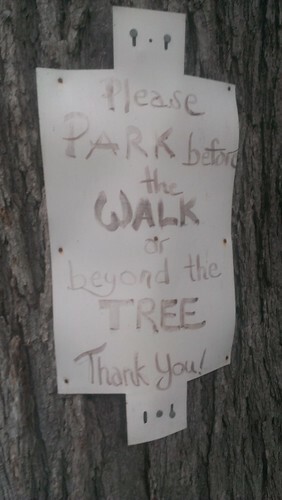 Please park before the walk or beyond the tree. Thank you. This one entertains me for a variety of reasons. Note that the sign was already there in Aug 2011 during Google’s drive-by. Flipping back to 2009, perhaps this red car was the inspiration for the sign? 2. It’s a corner house with a corner curb cut and a driveway off the cross street, so the house if quite accessible with or without the front crosswalk. 3. This is not a high density area. 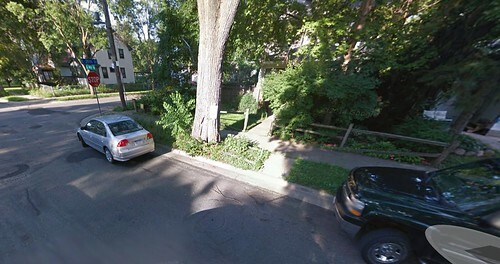 It’s not near apartments, commercial buildings or businesses that bring a lot of cars to the neighborhood. Because of that, I can’t imagine there being many parking problems. However, maybe that’s what causes the issue? Do people living in places where one can realistically park in front of their own property 99% of the time have a greater false sense of ownership than people in higher density areas? Why hug a tree when you can hammer it? 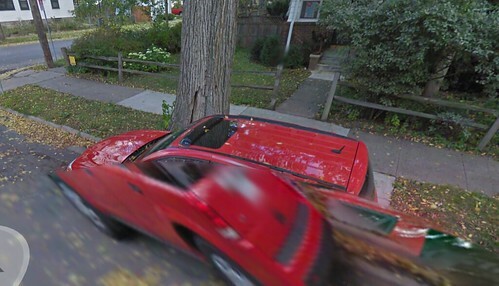 Author Ed KohlerPosted on June 11, 2014 June 11, 2014 Categories Cars, Minneapolis1 Comment on Please park before the walk or beyond the tree. Thank you. @StribRoper @edkohler Makes me want to buy an old clunker to park there forever. @dbrauer @StribRoper @edkohler @lawremipsum I would replace it with a sign that says "NO HANGING ILLEGAL SIGNS"
While I don’t think there are many legitimate reasons for sinking nails into trees to claim parking places one does not own, I did receive some more information about this particular situation in emails. The person living in this home is not a right-wing nut job dude who chose to live in an urban area the like example Rat described in the comments on the previous post. It turns out that the property is owned by an elderly woman who’s been getting some help from her family. 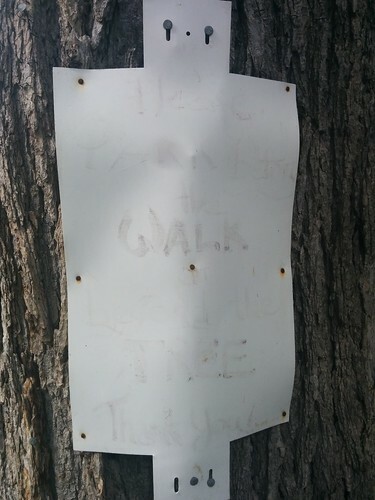 I was scolded for not researching why someone chose to hammer nails into a boulevard tree to claim a public parking place. 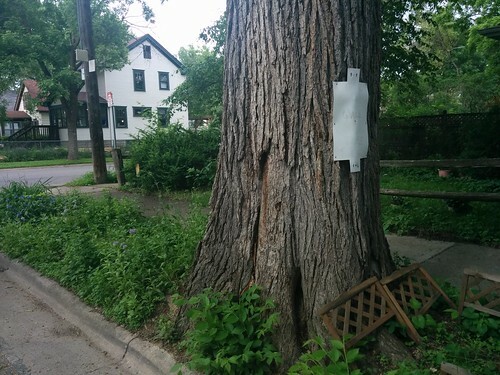 Knowing what I know now, I did some research to figure out what the age threshold is for nailing signs to boulevard trees in Minneapolis. There doesn’t appear to be one. Assuming this is an accessibility issue (perhaps elderly people come and go at the same hours of the day when the Blue Door Pub is busy enough to have cars parked nearly a block away? 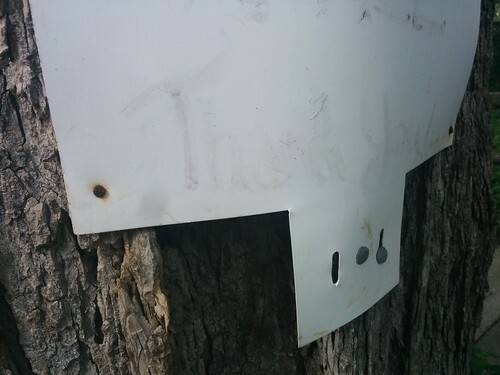 ), the city has ways of addressing this kind of situation that don’t involve nailing “Private Parking” signs into trees. Two different types of restricted parking can be requested depending on needs. I’m all for people aging in place. In fact, I do it every day. Here’s one other hammer and nail-free solution: The neighbor to the north has a driveway that runs along its south property line. I don’t know how neighborly the neighbors are on that block, but I think 99% of neighbors would be cool with their driveway being used for pickups and dropoffs of elderly neighbors. The “Longfellow was better before it had businesses people were willing to drive across town to visit” crowd has hammers and knows how to use them. What’s the Cost of Owning a Car That You’d Drop for Car Sharing? To me, that seems inflated because people giving up their cars for car rental probably aren’t paying anything near that to own a car. For example, I plugged in what I believe are accurate costs for my 2007 Honda Civic. This car was purchased new and financed for a short period, so there were some finance charges to divide over the past 84 months. And I divided the purchase price by the KBB trade-in value and divided that by 84 months to account for depreciation. I don’t pay for parking where I live, and assume I’d pay for the same amount of parking while out on the town, so that’s a wash. I have a garage I pay to maintain, but that’s not going anywhere. Our maintenance costs would be lower if we didn’t crack our front bumper jumping snow berms, but we don’t seem to be willing to change our behavior. But, that’s the cost of keeping my primary car on the road. I imagine that a large number of people considering using services like Zipcar are considering the switch by dropping their second car. In my case, the second car in our household was a Saturn wagon purchased used for $6,000 and driven for 12 years. I haven’t dug up the costs of keeping that car on the road, but they were surely lower than the Civic since it was driven less and maintained to different standards. Anecdotally, this particular model of car rentals seems to be doing better with people going from zero cars to having some access than from people going from two to one or one to zero owned cars. While there probably is someone who’s making car payments on a relatively new car (but, with lower maintenance costs), and paying a premium for car storage at home, who happens to live near a rental subscription location with reliable availability, that scenario seems very uncommon in most of America. 1. Often misleadingly described as “car sharing”, which is a twisted term to describe paying an Avis owned company for short term access to their car fleet. Author Ed KohlerPosted on March 10, 2014 Categories Cars1 Comment on What’s the Cost of Owning a Car That You’d Drop for Car Sharing? Eric Roper has an article in the StarTribune that looks at which areas of the town see the most cars towed during snow emergencies. And, more interestingly, which areas see the least tows. It seems to correlate quite well with distance from the impound lots. The data behind the map included some other variables that are kind of neat too. Here’s a spreadsheet with some tabs breaking down a few of those variables such as the age, make, model, and state where the towed cars are licensed. Cars between 10-15 years old top the list for trips to the impound lot. Hondas and Civic are high among car models, which may say something about both their popularity and lifespan. Thirty states and two Canadian provinces were represented in the towing data. Switching to a ton mile fee solves several problems at once: It raises the revenues we need for our transportation projects while ensuring that electric and natural gas vehicles don’t get a free pass. It would also encourage people to drive smaller cars fewer miles, which would achieve additional benefits like reduced petroleum consumption, emissions, traffic congestion and wear and tear on the roads and highways. You know what else would achieve those goals? Raising the gas taxes. 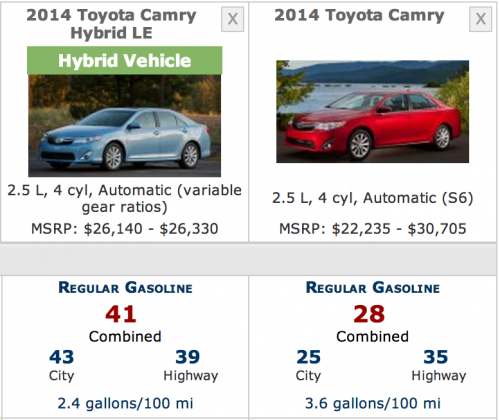 Hybrids sell better when gas prices are higher, which leads to cleaner air, less revenue for ExxonMobil, and ExxonMobil professors justifying eliminating one of the benefits of hybrid vehicle models. Assessing a half-cent fee per ton mile would cost a typical American car owner about $50 per year and would cover the highway fund’s revenue shortfall, according to my calculations. If all we need to do is raise $50/year from drivers to solve our transportation funding gap, we could divide that $50 into the 561.5 gallons/year of gas burned per drive annually and realize that raising gas taxes by 8.9 cents/gallon would bring in the same revenue as this professor’s ExxonMobil supported, convoluted tactic. Do you honestly believe that raising gas taxes by 8.9 cents/gallon (or, charged $50 annually) would achieve any of those things? Frankly, I have a hard time believing that he actually believes what he’s written. Republicans should like it because it would end the subsidies for alternatively fueled vehicles . . .
and Democrats should like it because it would encourage energy conservation. So would raising the gas tax. In this new phase of partisan agreement on budgets, revising the gas tax would be one more step in the right direction. Can we all agree to agree with this ExxonMobil funded argument? Please? Or, we could just raise the gas tax. Keep this fact in mind: There were about 260 million Americans in 1993 when the tax was last raised. Today there are over 315 million. And we travel more miles than we did two decades ago. That means the transportation infrastructure has to do more with less per-mile spending, adjusted for inflation. He points out that we don’t have as much transportation spending power because the gas tax hasn’t been raised in 20 years, isn’t adjusted for inflation, or even taxed as a percentage of the price of fuel. It’s just a flat tax per gallon that hasn’t increased since “I Will Always Love You” by Whitney Houston topped the charts. However, he doesn’t jump to the simplest solution (raise the gas tax, then adjust it to inflation). That would involve removing his ExxonMobil funded thinking cap. And, as we move into cities and use mass transit we will drive less. Let’s throw people who ride buses and trains under the bus? 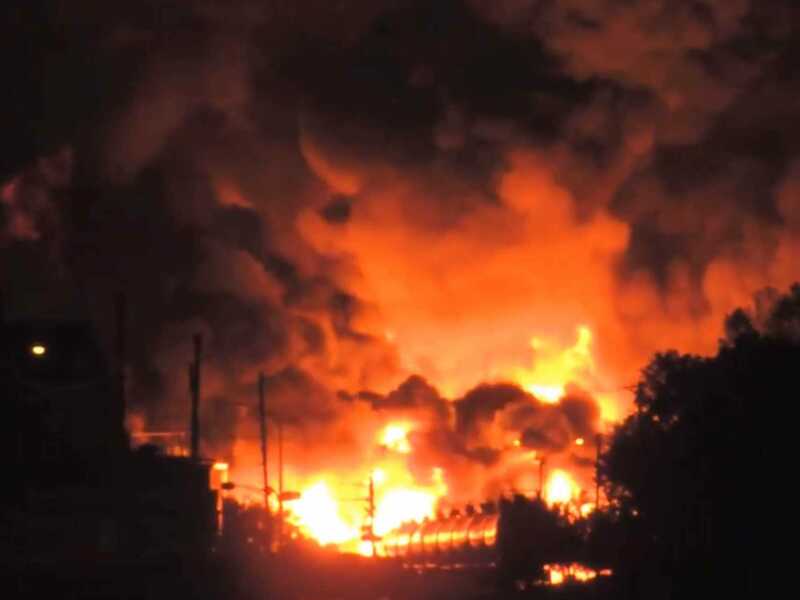 Perhaps ExxonMobil can buy up our country’s newly laid LRT lines and tear them out? It wouldn’t be the first time they’ve done that. 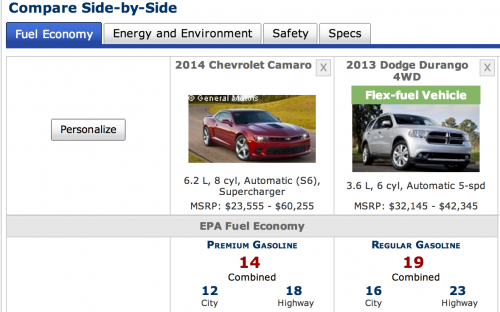 As cars become more fuel efficient they require less gasoline. Good. 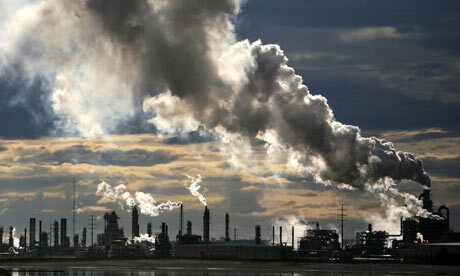 It’s dirty and dangerous to extract, refine, and transport, bad for our health, and bad for the environment. At the same time, alternatively fueled cars such as electric vehicles don’t pay gasoline taxes at all, and others, such as natural gas vehicles, pay a lower rate on average, so the current system subsidizes their use. I guess we could ignore that people driving fuel-efficient cars still pay a ton of taxes toward transportation through income, property, and sales taxes. That seems like a solid move for an ExxonMobil funded professor to make. One thing we won’t see from this ExxonMobil funded professor is a mention of how people who don’t own cars subsidize drivers through sales, property, and income taxes. That means our gasoline purchases — and our gas taxes — are declining, putting a strain on our trust fund. As an ExxonMobil funded professor, is he more concerned about declining gas taxes or gasoline purchases? Considering that his proposal is to actually eliminate gas taxes, which would lower the price of gas at the pump, it seems possible that people might end up buying more gas. Consider this: Do people buying heavier, more expensive cars (along with the higher taxes and licensing associated with them) consume less gas due to the higher annual fees? Would bumping up those fees by $50 change their behavior? The problem is already acute. Since 2000, spending by the highway fund has generally outpaced revenues; since 2008, the fund has required an infusion of $41 billion from the federal government’s general fund. A problem as simple to solve as increasing the gas tax is not a particularly challenging problem. As we get closer to finally adjusting the gas tax to deal with today’s economic realities, I can see why ExxonMobil and other carbon spewing companies would prefer to see our transportation infrastructure funded by something other than a tax on their pollutant. And, again, guess who’s tax money is being used to finance the “infusion” that makes up for the gas tax shortfalls? Drivers of fuel efficient vehicles and people who don’t own cars at all. Indeed. It’s hard to pay for something that has increased costs when you’re using a tax last increased in 1993. But, that doesn’t make it an impossible problem to solve. In fact, it’s quite simple. One other option would be to stop building/maintaining roads that encourage sprawl, lead to more gas consumption, but not nearly enough gas consumption to cover the cost of the roads and bridges that encouraged the sprawl. That tends not to be mentioned in this or other “lower the gas tax” editorials. One choice, of course, would be to raise the gas tax. But this would surely raise the ire of many people and might be politically untenable. Ire? We can’t have ire. Ire is what happens when people have to face the true costs of commuting by truck from an exurb. That must be avoided at all costs, right, ExxonMobil? ExxonMobil will surely do their part to help avoid rising the ire of many people by lobbying at all levels of government to make sure this doesn’t happen. What Should be Done if Gas Taxes Aren’t Raising Enough Revenue? One thing that confuses me about transportation funding is the idea that raising gas taxes is politically impossible, but creating new forms of transportation taxes like a tax on every mile you drive would be feasible. To me, the raising gas taxes seems far more efficient since all of the systems are already in place to collect the taxes. One of the predictions I have is that we eventually move over to tolling. Now, one of the reasons is if vehicle miles travel declines, the revenue source that we’re going to be using – that we’ve been using since the 1920s and are continuing to use to fund a lot of our road system — is the gas tax. If we’re bringing in less revenue from gas taxes due to less miles being drive (or less miles than projected) it seems like raising gas taxes could make up for that fairly easily. It’s not like driving has plummeted in America, so we’re not talking about extreme measures. Well, we’ll be consuming less gas because – gasoline because miles traveled goes down and we’ll be consuming less gasoline because fuel economy is improving and because we’re moving towards an electric freight. If gas tax revenues dropped by 2%, gas taxes would need to increase by ~2.1% to make up the difference. What effect would nudging up gas taxes 2.1% on have on gas prices? It would cause them to spike by . . . 1.4 cents per gallon. Creating a new form of taxation seems far less efficient than making small adjustments to the gas tax over time. If gas taxes were increased that little, I would expect it to have nearly no impact on people’s car purchase decisions and driving behavior. It would make up for lost revenue from fuel efficiencies and lower miles traveled without causing behavior-modifying pain. But, if gas taxes were increased significantly more than that more people might consider buying slightly more fuel-efficient cars for their next purchase. Say, a Civic rather than an Accord. Or, consider the hybrid model. This seems like something that could create a positive feedback loop. If so, perhaps the increase in taxes would be offset by lower fuel prices caused by less fuel demand? It seems like the side effects of higher gas taxes (less congestion, getting hit slightly smaller cars, sharing the road with quieter cars, less damage to our roads, dealing with less ridiculous parking jobs by trucks that can’t fit into parking ramp spots, less dependence on oil, and less pollution) are fairly positive. We have to switch from the gas tax to something else to fund infrastructure. No, we don’t. The USA has the worst fuel efficiency standards in the world, yet countries with far more efficient vehicles still manage to build and maintain their roads and bridges. How so? It probably has something to do with gas taxes being far higher nearly everywhere else. The country with the most expensive gas in the world happens to be an oil producing country. That’s right. They have oil, yet still have expensive gas because they think the benefits outweigh the costs. That country is Norway, where gas costs $10.12 per gallon with taxes. I had roommates from Norway in college, and when their friends from Norway came to visit they’d fight over who got to pay at the gas station because they thought it was so funny. They also thought it was funny that Americans had to take on so much debt to pay for college (their gas taxes help pay for roads AND free universities in Norway). If we raised the federal gas tax from 18.4 cents to $7.184 per gallon, that tax would generate around one trillion dollars per year. According to this article, it would only cost around $13 billion to make public 2- & 4-year universities free in the USA. So, we could make college free for around 10 cents per gallon in gas taxes if higher education was a higher priority. It would be interesting to see what changes $10/gallon would have in America. In my household (1-car family that drives around 11k/yr), that would equate to around $200/mo in additional car fuel costs, though not actually $200/mo in additional costs overall since it would just be a different way of paying for infrastructure and services than we do today. Still, I would imagine that it would create some changes in behavior. More fuel efficient cars are far easier to justify when they can save you thousands of dollars per year. For example, a family that drives a truck 15,000 and a car 12,000 miles per year with an average fuel efficiency of 20 MPG would spend $9,450 more per year on fuel at $10/gallon. A Prius starts looking pretty interesting when it saves thousands – rather than hundreds – of dollars per year in fuel costs. Now, what that thing is, whether it’s congestion charges or whether it’s using general revenue is a political decision. We’d be much better off if we had congestion charges and mileage charges. We already have congestion charges. When you’re sitting in bumper to bumper traffic, you’re getting crappy mileage. It’s a naturally occurring congestion charge. With gas taxes being so low in America, the pain doesn’t seem to adjust behavior to the degree that congestion charges (Levison’s apparent preference for having government impose those charges more directly) or significantly higher fuel costs would. For example, if your car knew what your paid for gas, it could calculate and report your cost per mile for fuel in real time on the dash. At $3/gallon, cruising at posted highway speeds burning gas at a rate of 30MPG gallon costs 10 cents per mile in fuel. Once you hit congestion and are only getting 20 MPG or less in bumper to bumper traffic, your fuel cost jumps to 20 cents per mile or higher. And we’re moving in that direction, it seems. But that’s got to be implemented and people are really nervous about the government tracking where they’re going. And that would replace the gas tax and it could replace a lot of property tax revenue. So most local governments fund roads via property taxes. And there’s no reason it should be based on property taxes, except that historically it’s been based on property taxes and it’s hard for local governments to implement gas taxes because if one of them implements a higher gas tax, then people can easily go to the next county over, the next town over and buy gasoline somewhere else. Whereas states, you’re less likely to leave state to buy gasoline. Levinson’s vision appears to be that mileage taxes would not only subsidize revenue lost from less driving and more fuel efficient cars, but also chip away at the tax revenues used beyond gas taxes to pay for roads. Another, simpler, way to do this would be to raise the gas tax to chip away at those taxes. But, I can see why people who own a lot of property might prefer to see transportation costs shifted away from their vacation homes. So gas taxes have traditionally been at the state level and property taxes have traditionally been used at the local level to fund roads, but there’s no reason if you have a mileage-based user fee and you have a uniform rate you couldn’t use that to pay for highway financing. And then you can differentiate the price. So if you’re driving when it’s less congested, you don’t pay as much. And if you’re driving in areas with less traffic in general, you don’t pay as much. Would be a couple of things that you could do to try to soften the impact of this and to use the financing mechanism to help manage roads better. We already have that with gas taxes. The taxes are just too low for most people to notice or care. The wheel already exists, but needs to be pumped up to be more effective. I’m trying to wrap my head around why we’d want to charge people less for driving on roads that have “less traffic in general”. It seems like the roads they’re driving on would be some of the least efficient roads to maintain since they generate so few miles of driving. If you own a vacation home at the top of a mountain accessible via winding mountain road, you may drive where there is less traffic in general, but you’re not likely generating enough taxes to maintain the road to your property. This person deserves a tax break because they drive where there is less traffic in general? Now, whether we’re going to go to a full-fledged highly dynamic congestion pricing system, that’s, I think, a few steps away, but it would be more efficient if we did. That would make sure that the wealthiest have the smoothest commutes even at the most congested times of day (ex. I-394). 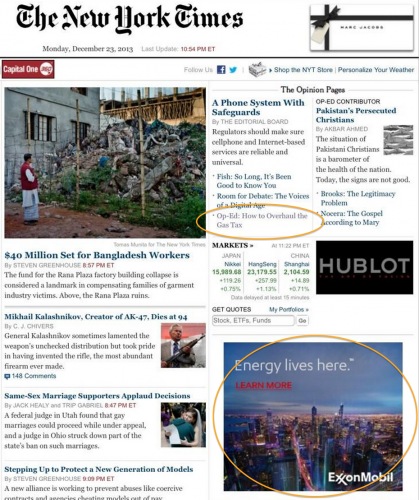 That probably plays well with the American Enterprise Institute’s audience. If congestion pricing like this provided a luxury service at a price far beyond the cost, thus creating a progressive tax rather than a regressive subsidy for wealthy people with long commutes, I could live with it. Taxpayers for Common Sense and the Reason Foundation think it’s “fairer” to charge a 47.8 MPG, 2,921 pound Prius driver the same cost per mile as someone driving a 16.6 MPG, 5,397 pound V-8 Dodge Durango. Do those cars create the same level of damage to our roads or emissions into our air? It’s the kind of fairness that the oil industry loves, and is willing to lobby for, since they’d be the winners. Author Ed KohlerPosted on December 20, 2013 September 4, 2018 Categories Cars, Politics3 Comments on What Should be Done if Gas Taxes Aren’t Raising Enough Revenue? 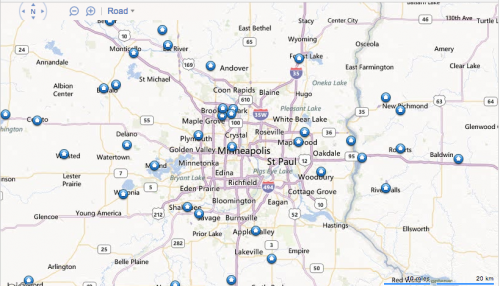 Who Complains the Most About the Price of Gas in the Twin Cities? To me, this helps illustrate the challenge with driving until you can afford more home. In real estate, the term “drive until you qualify” is used. As in, you decide that you want to have 2,000+ sq ft, 4 bed and 3 bath while spending less than $170,000. But, if work if found in the urban core, driving in from the extreme exurbs comes at a cost, as the right pane in the CNT map illustrates. It turns out that people living further out are spending a larger percentage of their income on housing + transportation than people who drive hundreds fewer miles per month. Which makes me wonder: Who complains the most about gas prices? I have a hunch that it’s not people living in the urban core since the percentage of their income spent on gas is far lower than those who live further out. They may even drive more fuel efficient cars, making their fuel costs even lower. Anecdotally, I can say that gas prices are not a big topic of conversation among friends of mine who live near their jobs. I wonder if there’s a feedback loop at play here, where people living further out end up justifying spending even more on vehicles since they know they’ll be spending an 1/8th of their waking hours or more in their cars? Which leads to higher insurance rates, which leads to more financial frustration they can ponder while listening to talk radio hosts explain to them that it’s all Obama’s fault (or, is it still Clinton’s fault?). High gas prices seem to be a popular topic on talk radio during commute times when people with long commutes are tuning in to hear people complaining about a cost that’s built in to their budget due to their commuting distances. So longer commutes increase costs, increase wasted time, and increase the time spent listening to talk show hosts complain about the increases costs and wasted time. Is that healthy? Author Ed KohlerPosted on April 5, 2013 September 4, 2018 Categories Cars2 Comments on Who Complains the Most About the Price of Gas in the Twin Cities? Clay Christensen shares a story about the popularity of milkshakes for breakfast during long morning commutes. They’re both something to eat and something to do while bumper-to-bumpering from the exurbs. For me, this is a good reminder of why I prefer reverse commutes or no commute. I’ve heard similar stories about coffee shops in the exurbs which open much earlier than urban locations so people can get their blended drinks and start their straw sucking commutes. Choosing a long commute is choosing to lock in a fixed amount of sedentary time into your day. Time when you can raise your blood pressure due to the driving frustrations. And plenty of time for mindless eating behind the steering wheel. Granted, I’ve heard people say that they like having a long commute because it gives them time to relax between work and home. It sounds like they’re in the wrong job or family to me, but those are their choices. 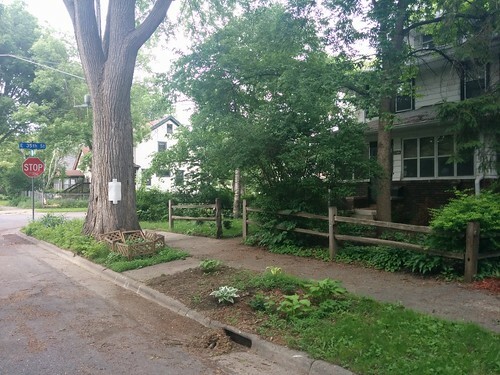 Bob Ingrassia has a post up on the Fast Horse blog about the painfully slow parking meters being installed in downtown Minneapolis. The post includes a video showing how long it takes between when money is inserted and a receipt is kicked out. Beyond the long delay, there is no feedback that the machine is even working during that period. Perhaps they should install some modem handshake sounds? I haven’t tried using the meters with cash, but have used them with credit cards a few times. To me, the workflow of the meters wasn’t exactly intuitive. As I remember it, you had to put your credit card in before you knew how much it was going to cost, which is a bit disconcerting. I think it’s smart to move toward these meters. Not having a couple pounds of quarters in the car can be a deterrent to visit downtown businesses. Adjustable pricing also allows the city to dynamically adjust meters based on times of day or days of week. I’m annoyed that these meters even exist. It just increased my cost of doing business in the warehouse district significantly. Enough so that I’m out when my office lease is up. It makes me wonder which costs have risen for this business person. It seems like this has the potential to increase business for merchants reliant on drive-up customers since metered spots may be less likely to be squatted on all day by downtown workers. If the business person is suggesting that their own cost of parking near their business will rise under this circumstance, I can see how that could be the case. But, I don’t think downtown metered parking was designed to accomodate 9-5 workers. As I understand the opportunities for the new meters, at their best they can help decrease congestion. How? By dynamically pricing to a price where one spot is always open on a given block. This could train drivers to grab spots when they see them rather than circling around and around until a spot opens up. By dynamically pricing meters based on true demand, the city can charge the true cost of convenience. Let’s face it: it’s surprisingly convenient to be able to street park in downtown. If the city charges significantly less for meters vs. what ramps charge, we will have a situation where people circle around and around downtown looking for meters rather than getting their cars off the road. That’s not good for congestion, pollution, or safety. They also point out that you can pay to top off your meter using any station in Montreal, rather than running a few blocks back to where your car is parked. Pretty slick.